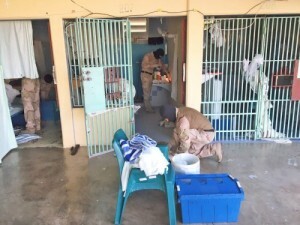 WILLEMSTAD - Police and Defense searched two cell blocks in the SDKK prison last week. The soldiers took part at the request of the Public Prosecution Service. They have a specialized 'search team'. Nine telephones have been found in the cells, a number of improvised stabbing weapons and a cutting knife. Obviously well hidden. The goods have been confiscated.